This little table matches the Glacier Country Child's Chairs. It has four posts and a simple construction just like the adult version. 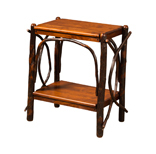 Combine the warmth of solid wood with the handmade style of hickory twigs when you add this end table to your living room. This table is just the right size for a child but is as sturdy as the identical adult table. The Montana Child's Table is a rustic table just for kids. The unfinished surface is fun to play on while the log legs are fun to look at.